Basements Can Be A Scary Place! Dark basements have a tendency to scare kids. Interestingly, these basements can also have the same effect on adults! However, the reasons are different. Children fear basements due to dark corners that transport their mind to a world of monsters. Adults, on the other hand, are terrified of the musty odor that hits their nose when they walk into the basement because it’s just adds another problem on their long ‘to do’ list they have to deal with. What Causes Bad Odor in Basement? The major cause is the presence of water around the foundation which can easily dribble into the cracks and lead to dampness in the basement. This along with poor ventilation and a dark cool environment provides the perfect environment for the growth of troublesome mold and mildew. Emissions from these microorganisms results in the familiar musty basement smell we all despise. Is it possible to get rid of this awful basement smell? How? This has been a mystery for many. The short answer is yes, it is possible to get basement smell out! In fact, there are a number of ways to accomplish this task. Read on to learn how you and your nose can be spared of the terrible mildew stench problem! The first step is to thoroughly clean out the basement. Collect all the trash from time to time and organize storage into plastic containers. Also make sure you sweep the basement, and wash the windows. Avoid storing a lot of paper in the basement as it tends to attract mold that leads to basement odor. A dehumidifier is a must have for all basement owners. Make sure the one you buy is appropriate for the square footage of your basement. We recommend using MOISTURESORB™ Reusable Moisture Removal Pouches. Simply hang or place these handy little pouches in the basement and they will absorb moisture 24/7 without any mess to clean-up like some other chemical products. It’s also reusable and does not need any power to work so it will last for years and save you money. Simply expose to direct sunlight or heat in a microwave to refresh and reuse. Get rid of any extra wood that might possibly be attracting and absorbing moisture. This includes furniture you are not using. The moisture results in mold growth and smells. Remove all old smelly carpets and rugs immediately. Understand that the moisture content in these fabric elements can be large. This enhances mold growth and consequently more basement odors. Tile floors or concrete floors are the best option. Use a water and mildew resistant coating on your floor for added protection. 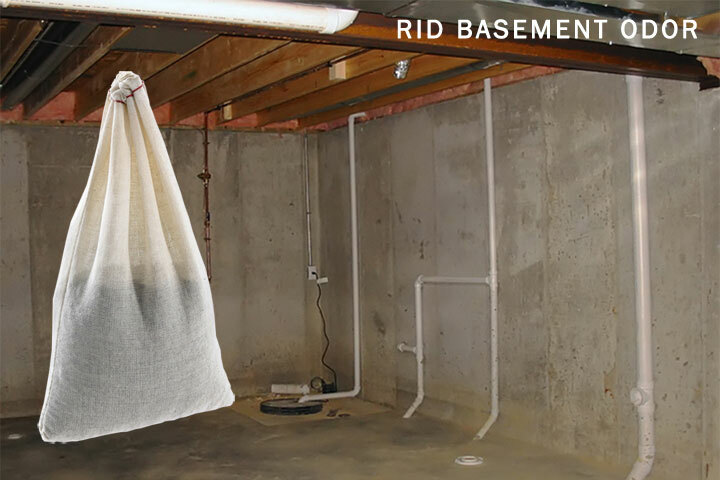 Since water is the major source of basement odor, it is important to fix these water related problems at the earliest. Make sure that water is draining away from the foundation and that the basement walls have a good waterproof sealant that is working. Ensure that there are no small cracks in the basement wall that can result in leakage. Consider using a mildew resistant paint on the inside walls. Following are excellent professional remedies that will help you get basement smell out. These are tested and proven products that are guaranteed to do the job and have a long history of success. This is an excellent deodorizer that helps you get the bad smell out of the basement. All you are required to do is to simply hang or place the pouches in the basement. It will facilitate absorption of moisture and eliminate the typical mildew odor. This is safe product that doesn’t use any harsh scents or chemicals and works 24/7 without power. It’s also reusable and built to last for years. All you need to do is to periodically refresh it by exposing to sunshine for day or heating in a microwave for 3-4 minutes and reusing. It’s that simple! This is a powerful natural deodorizer that works effectively towards removing nasty odors from basement floors. You just need to sprinkle a little on the floor, leave for a few hours or overnight to draw the smell out, and vacuum or sweep up. The effect is quick and incredible. You will be surprised to see how effective this deodorizer is! It can be used on concrete floors, tiles, carpets, and even furniture and other objects. Killing the mold in your basement is as easy as changing your ordinary light bulbs with SANIBULB’s! It will also destroy various other microorganisms such as bacteria, viruses, fungi, and dust mites without the use of any harmful chemical sanitizers. As an added benefit, it will also decrease your energy consumption by 75% and save you a lot of money! Once you have made a dedicated effort to fix water damage issues, exterminated mold, and eliminated the associated stench, it is important to take the precautions to prevent the basement odor from returning. The most important thing to do is to air out the basement regularly and to keep it as dry as possible using a dehumidifier like MOISTURESORB™. Another important preventive measure to take into account is to fix leaky pipes in the basement the moment you notice any leakage. This is a vital step towards the prevention of mold growth and smell. Also, keep a few pouches of SMELLEZE™ around your basement to control the stink so it does not have a chance to build up. These actions will definitely go a long way in preventing musty odors. You can purchase Smelleze pouches right from our website at http://noodor.com/ or you can give us a call at 770-667-8621 and we will be happy to take your order over the phone. We have many different products for all types of smells, however if you are dealing with a basement odor i would suggest using our SMELLEZE™ Reusable Basement Smell Eliminator Pouches. Simply hang these pouches in your basement and allow them to freshen the air.